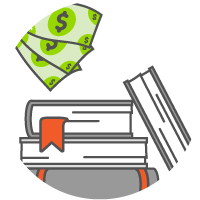 You won't find these low textbook rental prices at your campus bookstore. Plus, print a prepaid UPS return label when your rental is due. Choose what works best for you with our short term, quarter and semester rentals. You have the choice to extend or purchase your rental in your account at any time. Get notified via text when your order ships and when your rental due date is approaching. Join the 387,329 students that saved $48,687,218 by renting from us! “Best Deals. I spent 2 days finding my books and comparing prices! Will use again! Thanks for the free shipping!" Need extra time with your rental? Extend or purchase any time. If you aren't satisfied, let us know and we'll fix it. Get answers to your questions on our Help Desk. Contact Us on your terms: email, phone or chat.